Walter Benjamin was an icon of criticism, renowned for his insight on art, literature, and philosophy. This volume includes his views on Kafka, with whom he felt a close personal affinity; his studies on Baudelaire and Proust; and his essays on Leskov and on Brecht's epic theater. 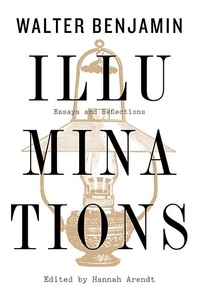 Illuminations also includes his penetrating study "The Work of Art in the Age of Mechanical Reproduction," an enlightening discussion of translation as a literary mode, and his theses on the philosophy of history. Hannah Arendt selected the essays for this volume and introduces them with a classic essay about Benjamin's life in a dark historical era.